Have you ever taken a solo and it just sounds like you are just fishing around for the right notes and immediately thought to yourself, I wish I could easily land on the right notes when I take a solo? Maybe you might have heard others do the same thing? This is a common problem amongst guitar players. Look no further, I have the antidote for you here. If you take a 12-bar blues progression, which is a common one to solo over in a jam session, there are basically three chords in that progression, they are A7, D7, and E7. Not only do you need to know the chords, but also the notes that are contained within each chord, so the chord of A7 is made up of A, C#, E, G; in D7 there are D, F#, A, C; and in E7 there are E, G#, B, and D.
The scale choice of many guitar players, to begin with, is the A minor pentatonic scale which contains the notes A, C, D, E, and G – see Ex 1. As you can see when you compare the A minor pentatonic scale to the chord tones above there are many mismatches there. For example, there is no C#, F#, B, or G# within the minor pentatonic scale so your solos can easily sound horrible if you don’t know what you are doing. More on that next. The key to sounding great when soloing is first; you must know what chord you are playing over at any given time in the progression. 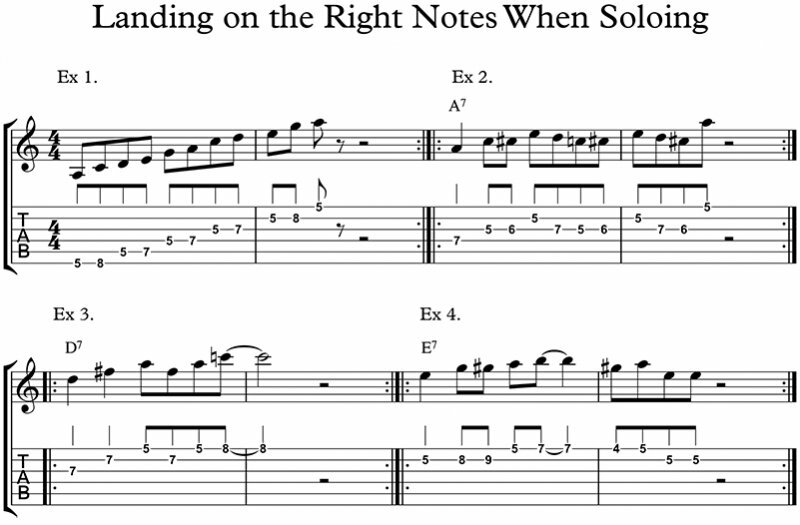 And secondly, the notes in your licks and phrases must match the chord you are soloing over. For example, it would be a good idea when over the A7 chord to add the C# note to the scale, all the other notes of the chord are in the scale (see Ex 2). When over the D7 chord, just add the F# note to the scale (see Ex 3), and similar for the E7, just add the G# or B (or both) notes to the scale (see Ex 4). You don’t have to add these notes every time you play over those chords, but just sprinkle them in every now and again for some serious ear candy effect. You only have to add one of these notes every 12 bars to make your listeners take note. Of course, you need to experiment with how this all fits into your playing style, too. Notice that each lick in Ex 2,3, and 4 ends on a chord tone, and any of the chord tones will sound great. Each chord tone has a different aural sound so experiment with what you like. Many top players like to use the third or seventh chord tones a lot, but they don’t use them exclusively so use your ear as to what sounds great to you. Now the trick is to put all this together into a coherent solo. So first of all record yourself playing a blues in A on your looper, cell phone, etc., then get into the practice of hearing the chord progression taking note of what chord you are over at any given time. Then once you can do that the next best thing is to practice putting these licks I have given you (or come up with some of your own ones) into place within the progression. Sometimes getting started doing this can be a bit tricky and frustrating, but if you stick to it I know you will have a lot of fun with this lesson. Remember it doesn’t take much extra effort to play like a pro, you just have to know what they are doing, and take a bit of time practising it.